I’m still munching my way through the beautiful rainbow chard growing in my vegetable plot. Remember Dennis Potter’s suggestion of leaving a clump of stalks to grow indefinitely creating a brightly coloured, monster-sized chard to decorate the garden. Nice idea but I can’t see it happening. The most recent dish this leafy green has ventured into is a creamy, spicy, noodly bowl of goodness; a meal that I eat frequently. Don’t have chard? No matter. Any combination of green vegetables would work just as well in this nutritious dish. Heat the oil over a medium heat. Add the onion, chard stalks and garlic and cook for a few minutes until onion begins to soften. Add the curry paste, stir and cook for a minute longer. Add the coconut milk and stock. Bring to the boil, add the green beans and noodles and cook until noodles are almost soft (3 mins for udon). Add the chard and prawns. 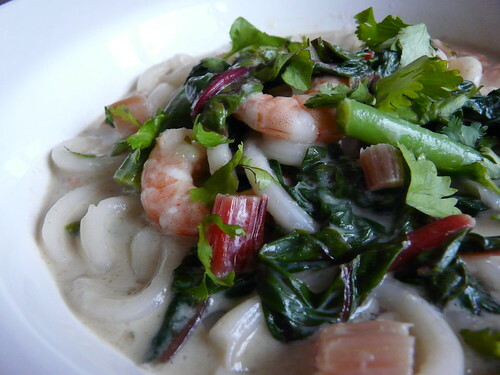 Cook for 2 minutes longer until prawns are pink and chard is wilted. Serve in large bowls with lime juice squeezed over the top and a liberal sprinkling of coriander. Love that first photograph Wendy. And a lovely dish you’ve used it in. I do like those udon noodles. Something so satisfying about their thick starchy-ness. I follow a lowcarb diet and can’t eat noodles or I will balloon up. Kathryn – It looks like a lovely pink tree, doesn’t it? Cindybin – That is a bummer. Still, this dish is very good without the noodles too. Oh this looks nice. I too love Swiss chard and am growing it here. I grew mine over winter so had loads during the spring. Have another crop now ready to eat and one in the mini green house sprouting ready to be planted later for a late harvest possibly through to spring. Like Courgettes this is a very versatile vegetable. Love this idea for the chard – I have some growing in my garden too and am looking for new ways of using it up. Pat – Hmmm, perhaps I should be planting more now. Going to read up on that! I do like that first photo too! Mmmm, noodley goodness. I love those udon, so slippery and then the sauce splashes all over your chin – brilliant. Maximum slurpage. I agree with your prettiness/tastiness chard dilemma – it is so lovely and I look forward to it brightening the garden in the winter, but I don’t like growing things I can’t eat and I’m sure it will be picked. I like your use of it in your noodley goodness dish. 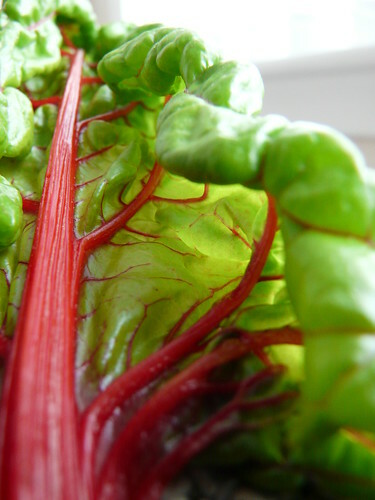 That chard is so gorgeous, what beautiful colours!